Friends of the Rappahannock was founded in 1985 as a group of citizens cleaning up trash along the river in Fredericksburg. Since then, we’ve grown to an organization of over 2,000 members and eight full time staff operating across sixteen counties, but we remain true to our litter-pickin’ roots. This past weekend, FOR was joined by the men and women of Rappahannock Rugby and other volunteers for a challenging on-water cleanup on the Rapp. 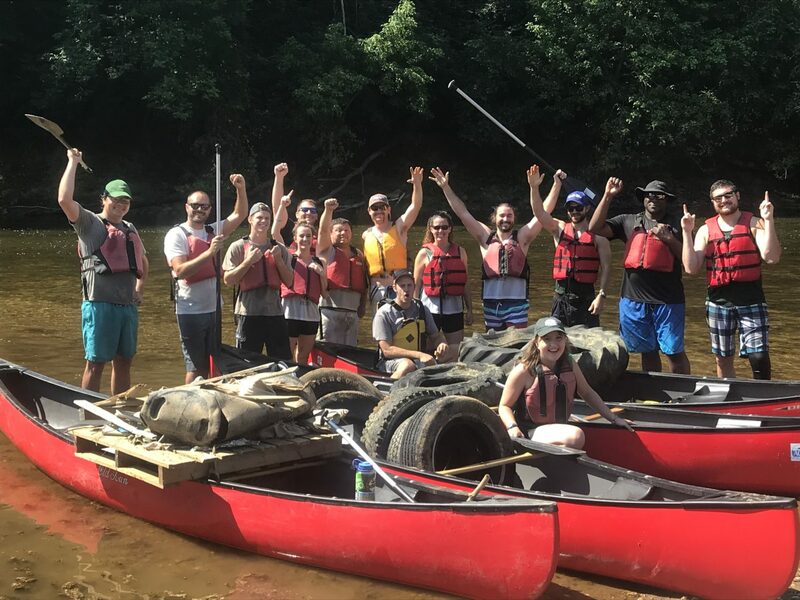 Our hardworking crew pulled 15 tires, a pallet, a trash can, and a bunch of other litter from a remote stretch of river upstream of Motts Run, totaling over 1,000 pounds of trash. It’s sad that so much trash made its way to our river, but also encouraging that we had such an enthusiastic volunteer crew step up to the plate. Thanks to Rapp Rugby for helping us keep our river clean! Rappahannock Rugby and other volunteers on their cleanup. Boats donated by Virginia Outdoor Center. If you’d like to join a cleanup, please contact Mick Torrey at cleanups@riverfriends.org. Cleanups generally take place between 9am and noon. FOR provides all materials including snacks and drinks. In addition, we are pleased to announce that Big Fall Cleanup 2018 will be held on October 7. Stay tuned for sponsorship and group volunteering opportunities for this event!